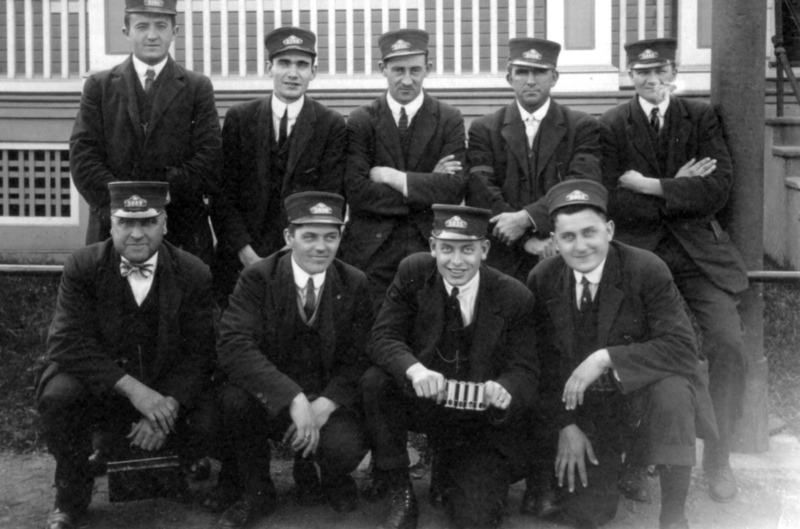 Trolley men at Willow Grove trolley car barn, 1913. Louis Kuhn, back row (at left). My father worked on the Willow Grove line and the Route 50 line. He retired in 1951. His first route was the Willow Grove line which was a swing run. He would get up at 4:00 a.m., go to work, make two trips, come home, sleep a couple of hours, then leave again at 3:30 p.m. and work to take the workers home for supper. At that time York Road was not fully paved and the trolleys ran along the curb just like railroad tracks were laid -- no paving. The trolleys would really rock side to side. The end of August picnics were held for employees and family. Late in the afternoon John Philips Sousa's band would play.